The discovery of coal in Tharparkar and changing agricultural practices are threatening the agricultural rangelands and consequently, the rights to livelihood and the food security of local farmers, writes Abdul Waheed Jamali. Tharparkar is a dry region in the southern part of Sindh province in Pakistan. It mainly thrives on rains and there is a saying, Meenhan Thar Lae Rehmat Aahin, Thar Jeko Mout Aahy aein Takleef Aahy “Rains are a blessing for Thar/desert else it is a fatal and daunting desert”. Tharparkar supports a population of one million spread over 2350 villages pressed on 19,541.33 square Kilometres. 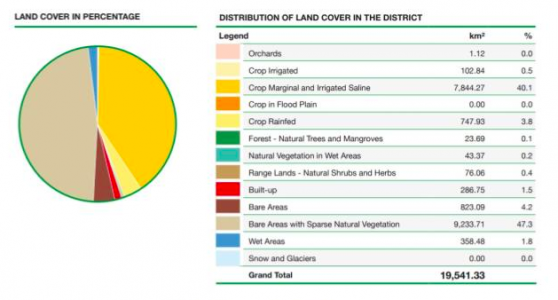 The above table is featured in the Land Cover Atlas of Pakistan which estimates that more than 92 percent of land cover of Tharparkar constitutes the livelihood and food source of the people. Livelihood depends mainly on grazing animals and partially on subsistence agriculture. Agriculture is mainly dependent on monsoonal rains which are erratic and variable in quantity and to a very little extent sweet ground water is available at a few places. The current livestock population of Tharparkar district is probably above six million. Most people of the area depend on agro-pastoral economy for their livelihood and live nomadic lives. Livestock, fully or partially, contributes to the financial system of every household of about 1.5 million people of the district. Besides, uncertain fate, famine is also inherited by the people of this region. As per forest department, Tharparkar region has 109, 516 hectors of rangelands. Rangeland is land which is not allotted to someone for the purpose of cultivation. When there is no cultivated crop on farmlands, farmland and rangeland are used as open meadows for livestock. Nobody refuses anybody the right to leave their livestock in their farmland. The only prohibition is that nobody is allowed to fell trees from farmland that does not belong to them. “droughts are not a new thing for the pastoral people of the arid lands. In the past, they maintained their livestock during drought periods by migrating from one area to another without much restriction. They had historical links with the farmers of the irrigated lands. The cultivated areas along the herders’ migratory routes provided crop residues to the livestock of the migrating pastoral people and in the process the agricultural lands too benefited from the manure. During the drought periods the pastoral communities got some relief also by engaging themselves in harvesting and threshing of wheat crop, because these operations were manual and required extra manpower. However, the situation has now changed. The introduction of subsidised inorganic fertiliser, and increases in horticulture, tractors, and commercial livestock farming by agricultural farmers has made all the difference. Now the historical cooperative relationships between the pastoral communities of the rangelands and the farmers of the irrigated agricultural lands exist no more”. The situation has now become more challenging for the pastoralists of this region after the discovery of coal fields in Tharparkar by the Geological Survey of Pakistan (GSP) and the United States Agency for International Development. Thar is numbered 16th amongst largest coal reserves in the world and Pakistan has emerged as one of the leading countries – seventh in the list of the top 20 countries after the discovery of huge lignite coal resources in Thar Desert; comprise around 175 billion tonnes sufficient to meet the country’s fuel requirements for centuries. Tharkarpar desert, photo credit: Zaferauf, Wikimedia commons, CC BY-SA 4.0. Local activists and civil society members have also expressed their concerns, stating thatAfter many efforts, finally Sindh Engro Coal Mining Company (SECMC) is about to start generating electricity from the Coal. SECMC is a joint-venture between the Government of Sindh and Engro Powergen Limited (EPL) one of the subsidiary of the Engro Corporation. However, civil society activists who have observed this, disagree with SECMC and have recorded their protests in number of ways. Besides, other arguments of Civil Society, this write-up is an attempt to illustrate the importance of rangelands v/s economic argument. “land and resource loss, and change and fragmentation in the rangelands of Tharparkar will increase dramatically due to both ‘external’ and ‘internal’ influences, including a lack of recognition of land and resource-ownership rights, poor land-use planning, and privatisation processes. These influences will have significant negative impacts on thousands of rangeland users, including pastoralists and hunter-gatherers who depend upon rangelands for their food and livelihood security, as well as will affect national economies, peace and security. Predicted changes in climate highlight the importance of maintaining livelihoods, such as pastoralism that are able to adapt to and have a history of coping with aridity and unpredictable climatic events and stress. The comparative advantage that rangelands and rangeland peoples have in this regard will be compromised by their loss of access to resources and land”. 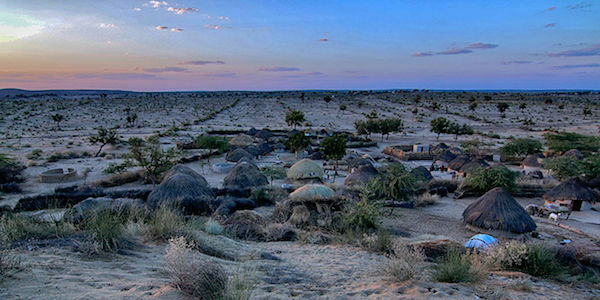 Civil Society Organizations (CSOs) are therefore demanding that Thar must be given priority in matters of livestock development and the SECMC must come up with proper rangeland management, insurance of livestock and compensation for lands, since coal mining and its related activities would disturb grazing areas, threatening the livelihoods and the food security of pastoralists. For understanding the pastoralist’s version, I conducted an interview with Mr. Tanveer Arif, Chief Executive Officer of local NGO Society for Conservation and Protection of Environment (SCOPE), working in Tharparkar for pastoralist rights since 1992. According to Mr. Arif most of the Thar Desert land is not surveyed and also all of the land is technically governed by the provincial forest department under rangelands and revenue department. Hence, many of the affected people don’t have ownership titles. Therefore, tenure of lands must be ensured as per customary law because the indigenous and locals are the custodians of the lands. Mr. Arif explained that Pakistan is also a signatory and ratified the Voluntary Guidelines on the Responsible Governance of Tenure of Land, Fisheries and Forests. He further emphasised that if the Government and SECMC help the pastoralists; the efforts would be a compliance of the National Action Plan of UNCCD for combating desertification in Tharparkar and help Government for earning compensation from the United Nations Framework Convention on Climate Change under REDD which stands for reducing emissions from deforestation and forest degradation. The Government of Sindh is already aware of the issue and concerns of the pastoralist’s communities of Tharparkar. Whilst the SECMC may have already considered the rights of the pastoralists and rangelands management in their development plans, no proposals have been discussed or presented at any forum for seeking endorsement from CSOs and local people. To address this, the SECMC should arrange a forum to present all the proposals for reducing concerns and anxiety of the pastoralists of Tharparakar and designs a grievances reversal mechanism.